This RotoZip is by far one of the most versatile tools we've ever had the pleasure of using, and the manufacturer is always coming out with new attachments that add one more ability to this tool's already impressive resume. RotoZip was founded in 1972, when a professional drywall contractor came up with a better way to cut drywall. From there, a system of tools and accessories grew, and Bosch bought the company in 2003, bringing all its attributes to an already fantastic product. In this kit, you get the tool as well as the Zipmate and the circle cutter, which will get you started exploring everything this tool can do. Basically, the RotoZip is a rotary cutting tool, but with a wide range of bits and attachments, you can slice through just about any material up to an inch thick. The Zipmate that's included here is a right-angle attachment that lets you use wheels instead of bits for an enormous range of materials, everything from concrete and brick to steel, iron, slate, and ceramic floor tile. The handle is great for additional control, but in most applications, the RotoZip is easy to use with just one hand around the tool body, too. Because of the keyless collet system, bit change is tool-free, but adjusting the depth does require using a wrench. I had my 1st chance to use the saw yesterday. I was working on a job that normally required a wood chisel. The RotZip was a great time-saver. It cut through the wood with ease. I would definetly recommend the model with the light. The only negative is that the saw is produces a loud screeching noise at times. Hearing protection might be a good idea for large jobs. This tool is a very helpful addition for woodworkers. I bought this tool last weekend for a bathroom project. I used it about 4-5 times to cut some drywall. When I went to change out the extension, I found that my keyless chuck is stuck. It will not open up no matter what I do. I will be returning this over the weekend. I searched Google for "Rotozip Keyless Chuck" and found a forum where the person had the exact same problem. I recently started the project of building a deck. I have been wanting a spiral saw for a while and I came across this kit. First of all the saw is very high quality. The zipmate attachment, the bag, and the jigsaw handle are also very high quality. The circle cutter attachment could be built a little heavier, but it will get the job done. You get a nice assortment of bits and wheels in this kit. They even include a bit holder. It took me a few minutes to get used to the saw, but after I got the hang of it I love it. The keyless chuck is a nice feature. You can change bits without a tool. I always hated that about a dremel tool. The variable spped is a bit of a marketing ploy. 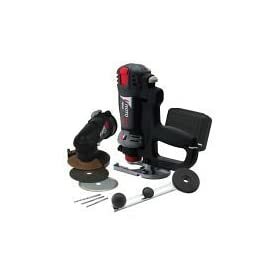 Most materials need to be cut at high speed, but it does have variable speed control. Bottomline, if you have a need for a spiral saw you can't go wrong with this kit. I just installed heavy plastic polystyrene tub surround panels in a bathroom re-do project and I had to trim the panels and make faucet hole cutouts---the Rotozip zipped thru this stuff like a hot knife thru butter--also had to grind away the base of a heavy metal door frame for floor panel installation---the tool paid for itself in one project!! Out of the box, the chuck was frozen solid (minus one star). Returned the tool. Their instructions specifically say to call them, do not return it to the vendor. I'm supposed to halt a project while they fix their problem? The replacement worked like the original should have. Subtract another star because I'm not sure this product is worth twice the price of the DeWalt DW660SK kit. But once I had a functioning unit, it works like it is supposed to. This tool is much better than a Dremel . It has more power and more versatility and if you buy the RotoZip FS2 Flex Shaft Attachment you get pen like precision. This tool becomes a Dremel on steroids. 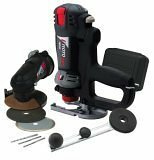 The jig saw handle provides you with a jigsaw that glides over your work cutting angles with depth precision that are only possible with a spiral saw and providing you with the firm platform of a jigsaw. The Sanding and cutting disk head attachment are equally useful and well made. Great product and worthy of 5 stars.